Samson is a popular Biblical figure perhaps best known for being blessed with super-human strength as long as his hair was long. However, regular Sunday school attendees know that there's a lot more to know about the Hebrew he-man introduced in the Book of Judges. First of all, the arc of his life, mirrored that of Jesus Christ in many ways. For instance, both were the product of a miraculous birth announced by angels. Jesus' mom was a virgin, Samson's was barren. Each was betrayed by a confidante, Judas and Delilah, paid in silver coins. Each ultimately fulfilled a prophecy by delivering their people, the Israelites. And so forth. 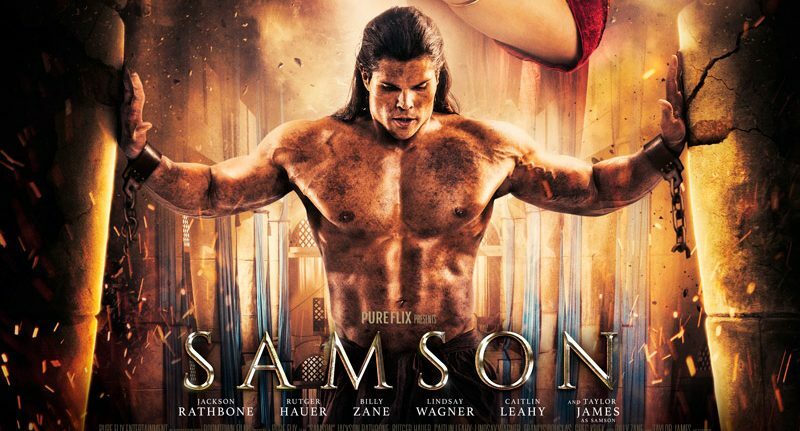 Co-directed by Bruce Macdonald and Gabriel Sabloff, Samson is an epic biopic which fleshes out the one-dimensional warrior into a vulnerable soul with a full range of emotions. The picture stars Taylor James in the title role, and Caitlin Leahy as Delilah. The film unfolds in Gaza in 1170 BC which is where we find the Jews enslaved by the Philistines. But as Samson matured from a boy into a man, it was hard to ignore his threatening combination of ambition and combat skills. So, to show the upstart who's boss, the sadistic King Balek (Billy Zane) arranges a duel with Bolcom (Dylan Williams), a seemingly-invincible behemoth from Egypt. At first, Samson falters during the fight, prompting a gloating Philistine to ask, "Where's your Hebrew champion now?" a query ostensibly inspired by the Edward G. Robinson's classic line "Where's your Moses now?" uttered in The Ten Commandments. Not to worry. Samson picks himself up off the ground and disposes of the imposing opponent in due time. Rather than recount what ensues, suffice to say that the story faithfully follows the parable's plotline . That ought to resonate with evangelicals who see the scriptures as history and thus prefer a literal interpretation of the Bible. So don't be surprised to see Samson slay a lion with his bare hands or suddenly lose all his power when shorn of his locks. An old school religious epic harking back to Cecil B. Demille, replete with mob scenes and breathtaking panoramas.